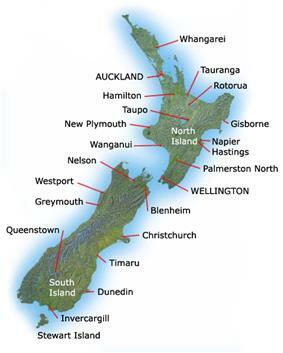 New Zealand – sovereign island nation located in the western South Pacific Ocean comprising two large islands, the North Island and the South Island, and numerous smaller islands, most notably Stewart Island/Rakiura and the Chatham Islands. 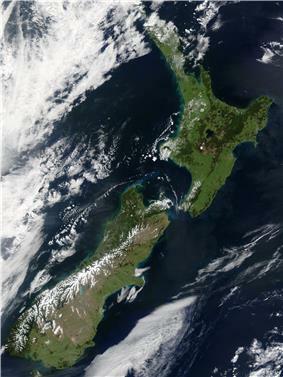 The indigenous Māori named New Zealand Aotearoa, which is commonly translated into English as The Land of the Long White Cloud. The Realm of New Zealand also includes the Cook Islands and Niue, which are self-governing but in free association; Tokelau; and the Ross Dependency (New Zealand's territorial claim in Antarctica). New Zealand is notable for its geographic isolation, situated about 2,000 km (1,200 mi) southeast of Australia across the Tasman Sea, its closest neighbours to the north being New Caledonia, Fiji and Tonga. During its long isolation New Zealand developed a distinctive fauna dominated by birds, many of which became extinct after the arrival of humans and the mammals they introduced.